Kelly Duer is coordinating a study of foster care for medium and large dogs, sponsored by Maddie’s Fund, an organization working to make ALL shelters no-kill. 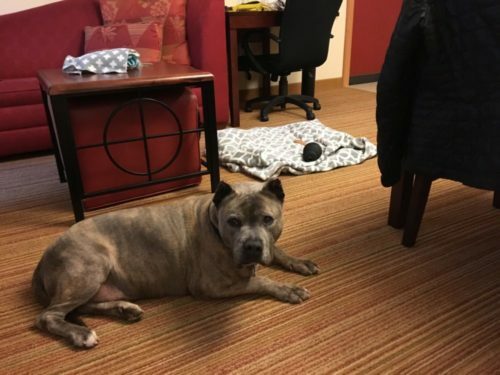 Last month, as part of Kelly’s study, she visited the Ventura County Animal Shelter and took some of their long-stay dogs overnight in her hotel room to give them a break from the shelter. Here, Kelly met Mugzy. Mugzy is the shelter’s longest resident. 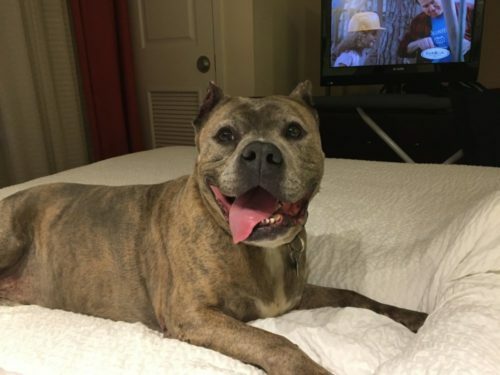 He’s a 9 year old pit bull, and has been at the shelter for over 500 days. He has Old Man’s Vestibular Disease, which causes him to be a little wobbly when he walks, and can make it easy for him to fall over when he gets in and out of cars or going over curbs. 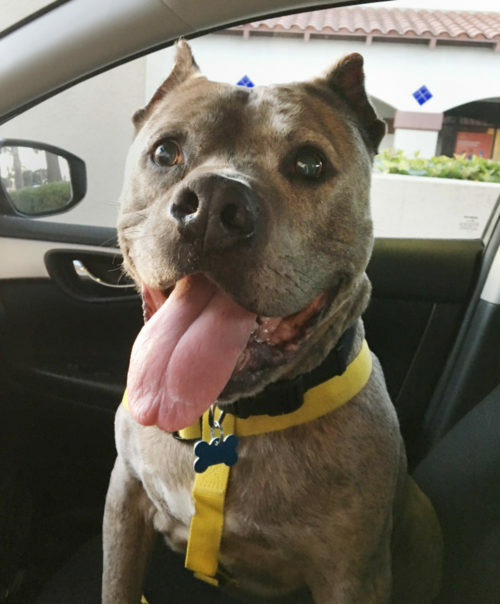 Still, he has a friendly demeanor and a sweet smile, and Kelly was happy to take him out for a day – his first time away from the shelter overnight in over 500 days! Their first stop was the beach at Ventura Pier. Kelly didn’t want him to walk too far, and he seemed more interested in sniffing trees, so they didn’t stay long. After that they made a trip to Petsmart for a bully stick and Nylabone. 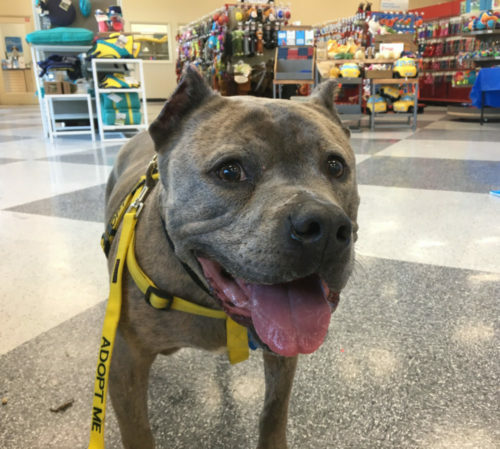 “Mugzy’s face lit up the second we entered the store. He walked around for a long time, sniffing every little corner. It is definitely his happy place.” Kelly says. 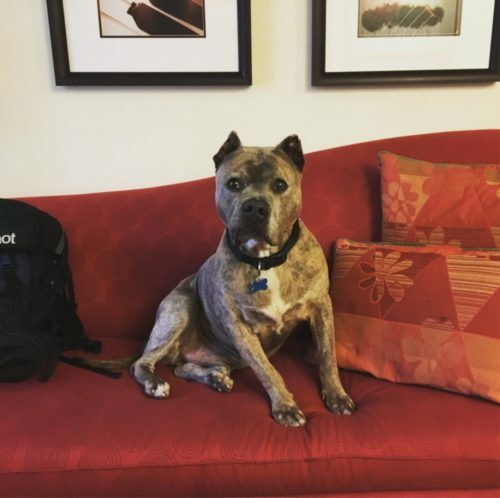 Mugzy got to stay with Kelly in her hotel room for the night instead of the shelter. He was an excellent guest, made himself at home and slept soundly. Their day out had to come to an end, and before going home Kelly begged the shelter volunteers to do what they could to find Mugzy a forever home and take him back to his favorite store. Encouraged by Kelly’s enthusiasm, they managed to get a local newspaper out to take a few pictures of Mugzy and make a video about him! Kelly and Mugzy had a really fantastic day, but at the end of it, he had to return to his kennel. 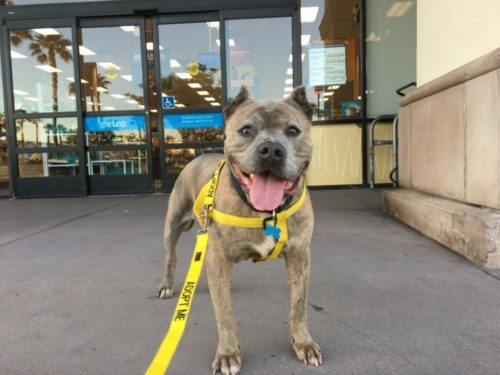 Mugzy is still available for adoption from Ventura County Animal Services, and has lots of smiles and cuddles to offer the lucky family who gets to give him his forever home! See more videos and learn more about Mugzy here!